Microcontroller Market Size Expected to Grow Swiftly $102.18 Billion By 2024: Grand View Research, Inc. According to report published by Grand View Research, the growing need for flexibility and agility in the industrial ecosystem, owing to the decreasing product lifecycles, is expected to propel the industry growth. The consumer electronics market has also witnessed a significant growth due to the innovative technical developments. 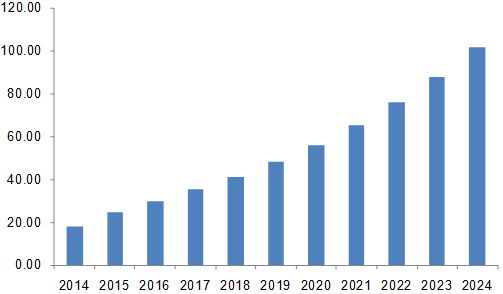 According to a report,“Microcontroller Market Analysis By Product (8-bit, 16-bit, 32-bit), By Application (Automotive, Consumer Electronics, Industrial, Medical Devices, Military & Defense ) And Segment Forecasts Till 2024”, published by Grand View Research, Inc., The global microcontroller market is expected to reach USD 102.18 billion by 2024. The growing need for flexibility and agility in the industrial ecosystem, owing to the decreasing product lifecycles, is expected to propel the industry growth. The consumer electronics market has also witnessed a significant growth due to the innovative technical developments. The 32-bit microcontroller segment has emerged as the fastest growing product segment over the forecast period, owing to its ability to offer incredible computation power. The technological developments for the realization of semi-autonomous and dully-autonomous driving systems also require the presence of 32-bit microcontrollers, giving impetus to the market. The automotive segment has also emerged as a predominant application segment over the forecast period. The increasing consumer demand for enhanced safety features, convenience functions, entertainment systems, and government edicts on emission control is driving the segment growth. The North American market is expected to remain one of the key markets contributing to the market growth over the forecast period. The application of microcontrollers for smart energy management and photovoltaic systems is expected to be the major application contributing to the market growth in the region. The Asia Pacific region is anticipated to witness a significant growth over the forecast period, owing to the increasing growth in the automotive and consumer electronics industry. The key players in the microcontroller market include Renesas Electronics Corporation, NXP Semiconductor, Microchip Technology, STMicroelectronics, Infineon Technologies, and Texas Instruments. Online Movie Ticketing Services Market: Increasing adoption of smartphones and PCs among consumers is expected to drive the online ticketing services industry growth over the forecast period. Digital Asset Management Market: The digital asset management market is anticipated to witness a healthy growth, ascribed to the increasing preference by organizations for rich media content for promoting brands and products. The rapidly growing automotive industry is expected to be the key driver of the market over the forecast period. Additionally, a high degree of competition in the industry has resulted in the price reduction, which is expected to further boost the market growth. The increased demand for devices supporting Internet of Things and Ethernet is also expected to favorably impact the demand for microcontrollers over the next 6 years. The growing demand of wireless sensor-based network implementation for monitoring and controlling of systems has enhanced the interest of companies in implementing the combination of low-cost systems. The demand for microcontroller chips integrated with wireless interfaces, such as Bluetooth, ZigBee, and microcontrollers, has also witnessed growth. Furthermore, the growing focus on the implementation of energy efficient solutions for both discrete and process industries will propel the sustainable manufacturing in industry automation for a more efficient process. Flexible manufacturing and asset management will also influence the factory integration, offering high potential for automation and customized solutions among the industrial applications. Explore microcontroller market research database, Navigate with Grand View Compass, by Grand View Research, Inc.